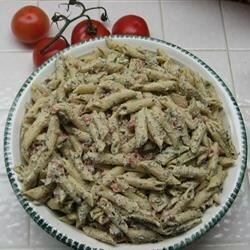 "This pasta recipe is so easy and so good! Wonderful made with crab, shrimp or chicken. You can also use fat free cream cheese if you're watching calories. Serve with grated Parmesan." In a large saucepan over medium heat, heat olive oil. Stir in garlic, basil, oregano, parsley, tomato, salt and pepper, and cook 5 minutes. Stir in cream cheese until melted. (Add meat, if desired, at this time.) Heat through, toss with cooked pasta and serve.